A TAXIDERMIST has found Mexico's answer to 'bigfoot' — and STUFFED the legendary blood-sucking beast. 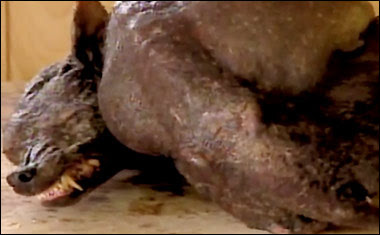 Rumours of a mythical hairless creature named chupacabra — or "the goatsucker" — have been circulating throughout America since its first appearance in Puerto Rico in the 1990s. And in recent years the creepy wolf-dog has been spotted repeatedly in the US. Now, a former student at the Blanco Taxidermy School in Texas, Lynn Butler, has caught a coyote-like creature some say is the fabled animal. The school's chief instructor, Robert McDaniel, said Mr Butler had heard something in his cousin's barn "tearing up the chickens pretty bad". "He left poison out thinking it was a raccoon or other vermin," Mr McDaniel said. The next day Butler discovered the dead animal, stuffed it and took it to the school to be identified. Mr McDaniel said since the discovery the phone has been "ringing off the hook" with chupacabra enthusiasts eager to hear about the beast. He said: "We've had about 100 calls a day." Jerry Ayer, owner of the Blanco Taxidermy School, said: "To be honest, I don't know what it is. "I'd probably say it's a freak-of-nature coyote, or a hybrid breed with a genetic mutation." Mr Ayer said he stuffs about 15 to 20 coyotes a year — but this is no normal coyote. He revealed: "The footpads are different. They're rather bulbous. And this has longer legs by a few inches. "It has a little fuzz around the feet. Almost like little socks of fur. And there's a little hair up the backbone. Very odd-looking. "The hairlessness is sinister because you can see the bones protruding at the hips." He added: "These types [of animals] will zip in and out of people's backyards and eat anything live or dead. They have two big canine teeth in the front and they go for the neck." 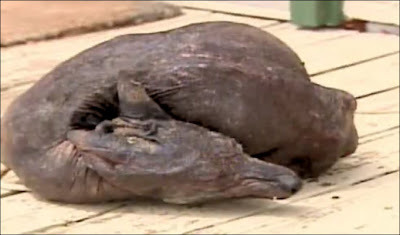 Two universities are now carrying out tests to try to identify the creature. Note : Two universities are now carrying out tests to try to identify the creature but I need to know what's going in your mind ?? what could be this damn blood sucking beast ?? wolf ?? dog ?! !